Step 1: Remove shipping plugs from pump ports. Some water from factory testing may spill out. Step 2: Connect fitting supplied with the pump the the RV’s plumbing. Use ½” I.D. Flexible hose as shown. Use hose clamps on the slip-on barb hose connectors. Step 3: Slide rubber mounts fully into mounting tracks. Step 4: Mount plumbing vertically, with the pump head down or horizontally in an accessible location. If mounting vertically, motor up, attach mounts first then pump head mounts, while supporting weight of pump. Step 5: Install inlet A and Discharge B port connectors. Firmly push clips C forward to lock port connectors in place. 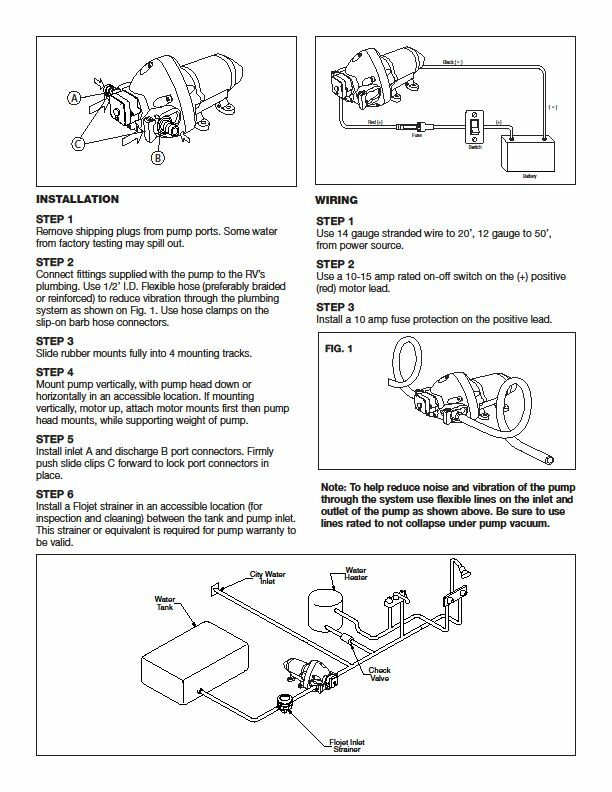 Step 6: Install a Flojet Strainer in an accessible location (for cleaning and inspecting) before the pump between the tank and the water pump. 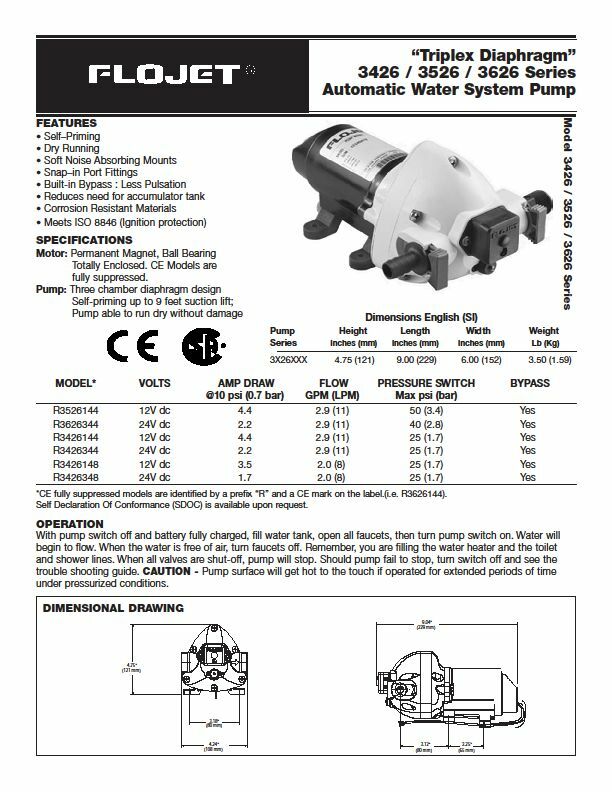 This strainer or equivalent is required for pump warranty to be valid. 12 volt - You can not put this in a house or plug into a wall - 110/115/220 volt will damage the unit. Step 1: Use 14 gauge stranded wire to 20', 12 gauge to 50' from power source. Step 2: Use a 10-15 amp rated on-off switch on the (+) positive (red) motor lead. Step 3: Install a 10 amp fuse protection on the positive lead. Allowing water to freeze in the system may result in damage to the pump and plumbing system. Non-Toxic antifreeze for potable water may be used with Flojet pumps. Follow manufacturer's recommendations. Refer to coach or equipment manufacturer's instructions for their specific winterizing and drainage procedures. Do not use automotive antifreeze to winterize potable water systems. These solutions are highly toxic and may cause serious injury or death if ingested. 1. Drain the water tank. 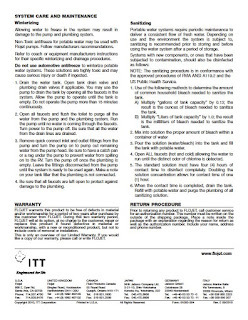 Open tank drain valve and plumbing drain valves if applicable. You may use the pump to drain the tank by opening all the faucets in the system. Allow the pump to operate until the tank is empty. Do not operate the pump more than 15 minutes continuously. 2. Open all faucets and flush the toilet to purge all the water from the pump and the plumbing system. Run the pump until no water is coming through the faucets. Turn power to the pump off. Be sure that all the water from the drain lines are drained. 3. 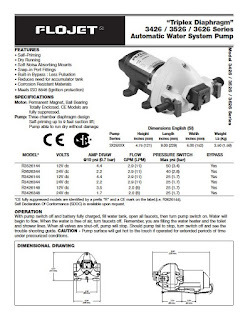 Remove quick connect inlet and outlet fittings from the pump and turn the pump on to pump out remaining water from the pump head. Be sure to have a catch pan or a rag under the pump to prevent water from spilling onto the RV. Turn the pump off once the plumbing is empty. 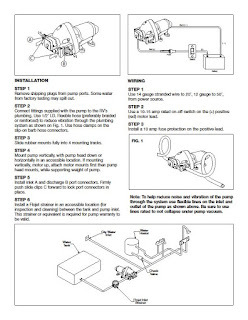 Leave the fittings disconnected from the pump until the system is ready to be used again. Make a note on your tank filler that the plumbing is not connected. NOTE: The sanitizing procedure is in conformance with the approved procedures of RVIA ANSI A119.2 and the US Public Health Service. 1. 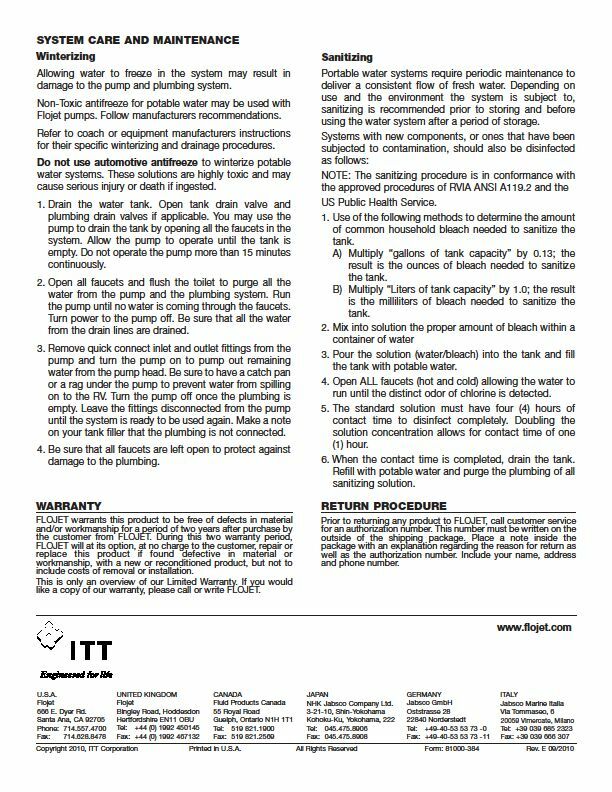 Use of the following methods to determine the amount of common household bleach needed to sanitize the tank. 1. A) Multiply “gallons of tank capacity” by 0.13; the result is the ounces of bleach needed to sanitize the tank. 1. B) Multiply “Liters of tank capacity” by 1.0; the result is the milliliters of bleach needed to sanitize the tank. 3. Pour the solution (water/bleach) into the tank and fill the tank with potable water. 4. Open ALL faucets (hot and cold) allowing the water to run until the distinct odor of chlorine is detected. 5. The standard solution must have four (4) hours of contact time to disinfect completely. Doubling the solution concentration allows for contact time of one (1) hour. 6. When the contact time is completed, drain the tank. Refill with potable water and purge the plumbing of all sanitizing solution. FLOJET warrants this product to be free of defects in material and/or workmanship for a period of two years after purchase by the customer from FLOJET. 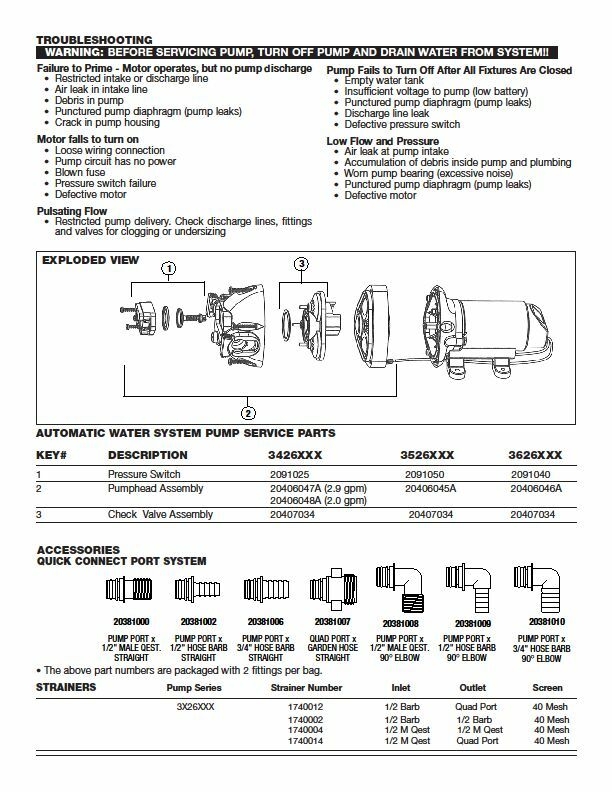 During this two warranty period, FLOJET will at its option, at no charge to the customer, repair or replace this product if found defective in material or workmanship, with a new or reconditioned product, but not to include costs of removal or installation. 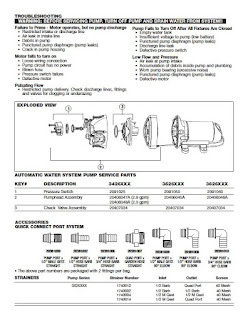 This is only an overview of our Limited Warranty. If you would like a copy of our warranty, please call or write FLOJET. Prior to returning any product to FLOJET, call customer service for an authorization number. This number must be written on the outside of the shipping package. Place a note inside the package with an explanation regarding the reason for return as well as the authorization number. Include your name, address and phone number.